There’s a new type of game out there taking over the internet. It’s a worldwide game of zombie tag where you download the toolbar (game) and you collect points based on your browsing. You begin the game as a “brain” and your goal is to stay a brain as long as possible. The longer you go without being eaten, and thus, turned into a zombie, the higher your health, score, and rank. You’re bound to run into another player eventually, and when you do, it’s every brain for themselves. The toolbar also has a social media function where you can “sit” at a table and chat with other players, anonymously, at different topic pages around the web. The nice thing is, you’ll run into other people who are visiting the same sites you are. This feature is actually pretty cool, I think. I’ve found myself locked on a webpage for hours wishing I had someone to rebound my thoughts off from, or just to ponder with. 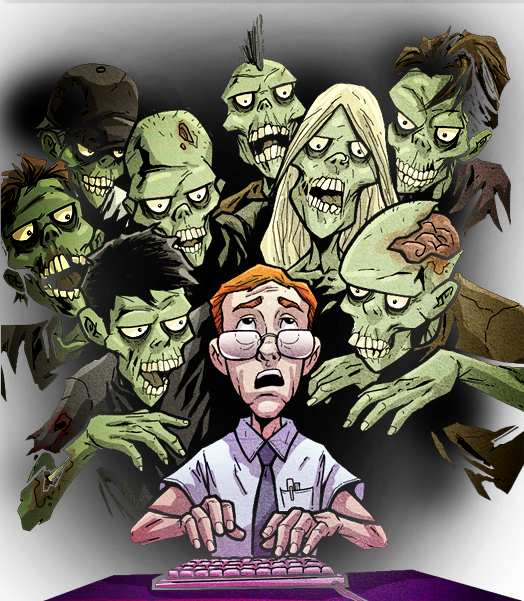 When you encounter another Brain, or Zombie, chances are, you’ll have at least something in common. Now for the icing on the cake; there are prizes for getting out alive, such as this round's prize: A Sony PS3 160G! Unfortunately, the game only works with Firefox right now, so if you don’t have it, you’ll wanna switch over for the next few weeks. This round started Dec 1st, and goes until the end of the month, so lurch on over to the game page at Zombie Dobby and sink your teeth in.